I’m yearning for pine forest. Note: Today’s post generated numerous comments from readers wanting to share their favorite, forested camping spots. Click on “comments” below to read about some of the wonderful camping locations available in the U.S.
Back in the day when all I could do is obsess about my dream to live in a travel trailer, I envisioned the crew and me boondocking all over the U.S. I had visions of Spike, Bridget and me, wading in a mountain stream, floating along a lakeshore in our kayak, climbing a rocky trail to a high, windswept vantage point, waking to a desert sunrise, returning to our home-on-wheels after a romp in the ocean surf, and many more picturesque scenes. Innumerable sighs, much preparation, and the passage of time have placed us in some of those visions already. One scene my mind returns to again and again is camping in a pine forest. I want to smell pine scent mixed with the aroma of forest sod. I want to listen to the whispers of wind in the pine boughs. I want to laugh at scampering squirrels playing on the trunks of fallen pines, teasing Spike with a game of catch-me-if-you-can. I want to eat eggs-over-easy and drink orange juice while anticipating a walk in the cool forest around us. I want to discover mossy places where lush ferns grow, their fronds embracing a giggling creek. I want to find mushrooms and pale wildflowers in beds of pine needles. Oh, to lie back in a lounger, Bridget snuggled in my lap, gazing up at sunbeams reaching down from the sky through the feathery branches of a magnificent pine . . . Meanwhile back in the desert . . . Still looking for the horses . . .
I’ve got to do something about our trash. The interior of the PTV is starting to stink to high heaven. My strategy for getting rid of garbage is to throw away stuff like old lettuce leaves some distance away from our camp or, if smelly like chicken packaging, seal it up in a plastic bag. Then I store it in the PTV until I can stuff it into a trash container, usually in a store parking lot. Well, in the Wickenburg-Congress area of central Arizona, the stores I’ve frequented don’t have easy-access trash bins. Thus, I’m sad to report, the PTV has become a landfill. The crew and I take off for Safeway in Wickenburg. After loading up the passenger seat with groceries, I scan the area for a trash receptacle. Nothing. Just a small one by Safeway’s door. Not good. We’re way past the point of that being adequate. I navigate the PTV around neighboring parking lots. Again, nothing. Finally I spy a big, black container. It’s squatting at the exit of a bank drive-through. I drive up. “City of Wickenburg” is printed on its side. Ah-hah! I can do this. If I’m really quick, no one will have the chance to complain. Trying to look nonchalant, I open the back doors and start heaving bags into the mouth of the black bin. Yay! I did it! Now let’s get outta here! Next I need to get rid of the paper trash. Our camp has a fire ring, or the semblance of one . . . rocks strewn about an area of loose dirt with ashes mixed in. No protection from the wind that kicks up without any notice. Plus it’s right next to a tree. How dumb is that? I could get out my shovel and start digging and move those big rocks into a circle. No, I don’t think so. Requires too much effort. Let’s see. I know! I’ll pour myself a glass of grapefruit juice and sit a spell to think this over. As I’m sitting and sipping, my line of sight falls on the . . . Yes! That’s it! That’ll work! I can burn the papers in it and they won’t blow away! My little charcoal grill can double as a trash incinerator! "Spikey, you'd better watch out . . . "
Well, maybe incinerator is a bit grandiose. Burn-buddy fits better. Anyway . . . I lift up the top where meat is grilled, and stuff in the a few papers and torn-up cereal boxes. The trash rests on top of where the briquettes are placed, so there’s good air circulation. 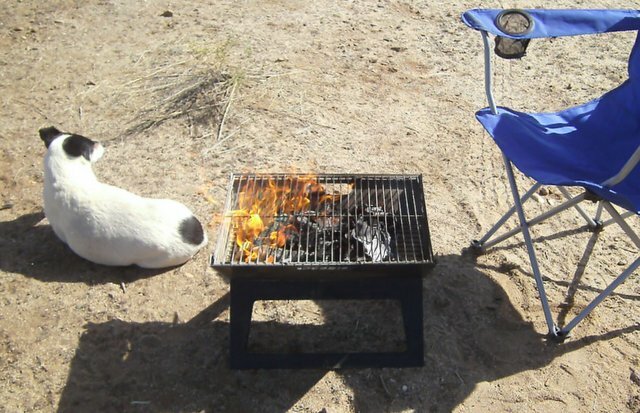 I move my new camp chair away from the smoke and instead sit in my five-dollar-falling-apart camp chair (every camper needs one of those), happily tearing and wadding paper, feeding and stoking the flames with a stick. Yep, once again it proves true . . . every problem has a solution. I’m playing Russian roulette every time I flush. I should keep valuables in here. Tomorrow I’d better hitch up and get on over to North Ranch’s dump station. The water tank must be getting low, too. It’d be nice if the key would open the cockamamie door so I can observe the water level. Squirting it with WD-40 helped a few times, but not lately. Sheesh. Yeah, yeah, yeah. Oh well, I’ll give it another try. Voila! My water tank! Nice to see you again! P.S. Float your cursor over pics to reveal hidden messages. Ooh. What fun! This entry was posted in Simple living and tagged adage, Arizona, boondocking, desert living, forest camping, RV, Wickenburg. Bookmark the permalink. And I’m loving hearing from you! Wise advice . . . take my time and avoid the bugs! I keep checking the temps in the Prescott National Forest. It’s still a bit cold up there. It sounds like your son gets good advice, too. If you can teach him to persevere, he’ll do well throughout his life. Hope you are having a good day . . . Sounds like you need to spend some time in Oregon!! We have lots of forest, lakes, stream, mountains, coastline, AND desert!! I’m surprised there is not a public dump in the area. That would be a good solution. If there’s a public dump, I don’t know about it. Landfills are usually for residents only, right? Yes, Oregon! I’ve had my sights on that state for a long time. Well, with summer coming, maybe you can head north where the pine trees are. It will be interesting where you’ll go. You know the northeast pretty well, I imagine. You’re right, I do know the northeast pretty well, although there’s always more to explore in any region. I’m looking forward to the forested mountains, not the scary roads, but the trees. Wow! Your opening paragraphs are poetic. As someone else suggested, you want to get up to the northwest this summer. If I don’t make it to the northwest this summer, I definitely will the following summer. With the price of gas I can’t cram a lot into one summer, which is okay with me. There’s so much to see! As you know from your extensive travels . . .
awhhh I am right with you…sounds so wonderful..i too yearn to smell the pine forests..i can yes I can well almost..sittin at my desk..its almost 5pm thank you rvsue you took me away..for a moment. I’m glad I could give you a break in your workday. That last hour is toughest. Sue, there are free and cheap places to stay in the East. This is the best online guide I’ve found. Don’t forget about the Mogollon rim northeast of Phoenix. There are some nice CPG up there too. And Greer is absolutely amazing ! Not sure about boondocking, but the area around Greer has public CPG and is gorgeous ! Flag is great … but our first year there, it SNOWED in May …. huh ?? The Mogollon rim . .. I’ve read other people’s camping experiences there, sounds like a good place to explore. There are so many different ecosystems and interesting geography in Arizona! Between Payson. Strawberry and Pine AZ there are some great places in the forest to boondock! I have camped all through there over the years. I would just find a forest dirt road and go exploring! I usually only stayed a couple of days because I was working at the Grand Canyon. Just a few miles north of Payson on both the Right and Left sides of the road, are places you can dry camp right next to the Verde River. Those were my favorite 2 places because I loved watching the cliff swallows acrobatics far above me in the rocky overhangs! Chuck and I just drove past those wonderful places last year because the MotherShip is to large to get down to the water area! I should have mentioned that Paysin, Strawberry and Pine are all along the Mogollon Rim! Okay, will do! That door was giving me trouble since way back before going to Quartzsite. Those doors are notoriously sticky. Ours has given us trouble from day one. We may try the lightly sanding solution – we’ve always had to jiggle the key and play around with it before it opened. And we’re nowhere near sand. Sue, go to Oregon, Idaho, Washington, and Montana. I’d tell you Tahoe for Ponderosa Pine, but no good boon docking up there that I know of. Plenty of BLM in Idaho–I loved the Sawtooth area. The Oregon Coast–State Parks are great. I couldn’t stand the desert in the summer. Would like to visit in the winter if I ever get out there, again, but chances are I’d head for the mountains. Yeah, Idaho’s another state I want to experience. I’ve salivated over so many pictures of Idaho’s rivers. Your forest vision sounds a little like where I park in summer on the North Rim under the Ponderosa pines. But it sounds even more like the Olympic Peninsula’s rain forest in Washington. Your persistence paid off. Prescott NF will definitely still be cold at night and the back roads could still be a little sloppy. You don’t have to be local to use the dump just up the road and they don’t charge much for a Big bag of garbage and do some recycling. Maybe I’ll visit the North Rim this summer and park under those Ponderosa pines. What dump up the road? South rim too! I worked at the Grand Canyon 5 summers back in the 1980’s and boondocked in the Coconino Forest every summer! It’s the last dirt road to your right before you hit the town of Tusayan (pronounced 2-c-ann)! Just wander down the dirt road until you find a spot you like! All ponderosa forests! Just north of Congress off 89 there’s a signed landfill. There are many boondocking places just outside the park in the Kiabab NF and right along the rim. Having trouble commenting on WP. Gaelyn you are right! I wasn’t sure of the name of the forest near the south rim of Grand Canyon until I saw Kaibab in your post! I stayed so many places during those 6 years… It’s a beautiful forest there…. I saw elk, golden eagles, several different kinds of deer and a few coycotes too! Thanks for reminding me of the correct name! You could become a vegetarian and have a worm composting container in the back of the PTV. Yeah, and I could put a raised bed on top of the BLT and grow my own organic vegetables! I have to balance the pretty with the not-so-pretty. Are you sure that “City of Wickenburg” bin wasn’t a Goodwill bin? Maybe you should have gotten a donation receipt. No, I checked first. It was almost full of trash. It probably was the bank’s bin provided by the City for paid refuse removal by City trucks. I completly understand your need for a pine forest. . I often feel the same way. Maybe it is our growing up in the beautiful area of Cambridge that has something to do with it. You only have to head up the road (over Yarnell hill) toward Prescott. There is your pine forest. However, it is still a little cold. My husband and I are looking forward to our summer in eastern Az. We summer in the Springerville/Eagar area. Forests and lakes abound. You will know for sure when it is your time to head to the forests. The desert heat will tell you. The desert heat and rattlesnakes awake! My heart skipped a beat at the sentence “Forests and lakes abound.” Sounds wonderful. Colorado !! My favorite state when I was in my RV. California too for pine trees and forests galor. Of course I live in the sierra mountains of ca. Love it. And yes, I am sure there are boondock places. Just doesnt seem so well known by fulltimers. I think you like Colorado. frugal-rv-travel.com has some great info on California boondocking. But, it is such a big state . Could take a couple years to see !! California has it all. Deserts, ocean, mountains. I think you like California. Have you been around California much? Southern and Northern are like two different states. I’ve never been to California. First, I use propane for cooking and a Wave 6. Only occasionally for the refrigerator and hot water. I just filled up my tank a few days ago and it took 10 gal. ; my previous fill up was back in November. So, about 2.5 gal /month. Second, I bet North Ranch has a place for you to dump trash as well as your tanks. You don’t need it now but that may be someplace to keep in mind. I don’t understand how you use propane only occasionally for your refrigerator. Do you turn off your fridge? How often do you cook using propane? North Ranch has trash bins but there’s a sign that says they’re for residents only. In other words you’re not supposed to drop trash there if you’re camping elsewhere. Dumping tanks is allowed for a small fee for Escapees members. The only time I use propane for the refrigerator is when I’m in transit from one place to the next and ‘blacktop boondock’ along the way or perhaps when I’m away from my FHU space for a long time during the day. I do not have the fridge turned on while driving. I probably average 1.5 times a day using my stove but each use is usually less than 1/2 hour. If I cook something that requires a long cooking time I will put it in my Thermal Cooker (a great gas saver). Thanks, Ed, for continuing this conversation. Your response has me thinking it’s my refrigerator that is the big user of propane, because, unlike yours, mine is running on propane all the time except when I’m on the road, which hasn’t been much lately. I’m paying more attention to positioning the BLT so the sun isn’t hitting the fridge. Maybe that will help. Your cooking time sounds similar to mine. I use the stove for the percolator every morning and for eggs maybe twice aweek. And 4-5 times a week I use the stove for cooking supper. I’m going to investigate that thermal cooker. My costs for propane aren’t a big worry for me because I’m saving so much in other areas (like rent). But I like conserving just for the sake of conserving, and I’d like to know how little money I can live on. Living like this is enabling me to save up for those big, bad expenses like engine repair, tires, medical, etc., and also for pricey gas for the PTV. Thanks again for the helpful input. Sue and crew, I am also recommending Oregon. You want trees, we have lots and lots of them. August and September are great months for Oregon. We have a bit of a rainy season… it runs about 9 months or so.. and we have a beautiful, but short, window of breath-takingly beautiful clear blue skies with beautiful night skies full of stars. It’s a lush and green and beautiful state with wonderful rivers and lakes to paddle that kayak on. You can chose a peaceful slow moving river, a placid lake, or you can go the whitewater (and white knuckle) route down the Rogue River. Take your pick. There’s lots to see and do and please, don’t forget to take in a play at the Shakespeare Festival in Ashland. Ashland is a very interesting town, you want to put that area into your plans, along with the Oregon Coast, then there are the deserts to the east. Lots to see and do,. Okay, nuff said. If nothing else, come for the moss. We will let you take some with you. You really sold me on the moss. LOL Thanks for the info about Aug. and Sept. beiong great months to visit Oregon … did not know that. I was something other than desert last weekend here in Tucson. I happened to take the drive up Mt. Lemmon (that takes you up to 8000-ft elevation within 30 minutes!). I couldn’t believe what a difference it was up there– forest pine trees, some snow on north-facing slopes. Made me feel like I’d just been transported to the California Sierras or Colorado San Juans. When it got a bit too cold to run around up there in my t-shirt and shorts, I just turned the car around and drove back down the mountain. Gotta love Arizona for these nearby little instant escapes from the heat! I know! Arizona is incredible! Now if it would get just a bit warmer up there in the pine forests! Just wanted you to know I read your blog each day, spent 2 days catching up from beginning to end. That was a couple of months ago. Last night I looked at the “Casita Me Gusta” video and noticed all of the other Casita videos posted alongside. So I spent 70 minutes watching the ‘walk through’ for a new Casita owner. Never plan to own one but was interesting because it explained a few of the things you have referred to in your blog. The biggest plus….he explained how her Fantastic vent fan works……now I know how mine works in the 5th wheel we purchased late last fall. Keep writing those entertaining, ‘boring’ blog posts. You are great evening reading and all the comments just make it better! Congratulations on making it all the way through more than 200 blog entries! I’m pleased to hear you enjoyed accompanying me from dream stage to here and now in the desert. You must be an authority on Casitas! Isn’t it incredible what resources we have at our fingertips? I watched some of those Casita videos before driving to TX to pick up the BLT. Thanks for the compliment and the encouragement to write more. I agree . . . the comments by readers add another dimension to rvsue and her canine crew. Susan – You just might need to spend some time near the Battenkill River with its pine trees and moss. You know, there is a campsite on that River not far from Cambridge where not only campsites are available but also kyack rentals I believe. So why not start working your way back east and come to the the CCS Alumni Reunion in July? Or maybe you cannot wait that long. There is also a campground at Lake Lauderdale. We’d love to see you and I know your sis would be overjoyed cause she is going to be there! Oh, Karen . . . How I would love to tube down the Battenkill once more! I think I know which campsite you mean. It’s near Arlington and the covered bridge. I have many memories of Lake Lauderdale. I won’t be going to the northeast in the near future. There’s too much I want to see that’s new to me. And when I see Pauline, I don’t want to share her with hundreds of her fans! I’d rather meander back to her home in Mississippi and visit the family, too. Thoughtful of you to make the suggestion . 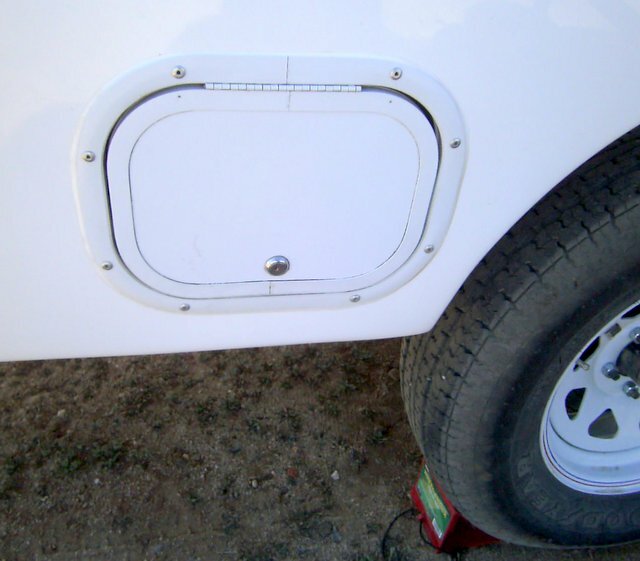 . .
Change out the lock on your water tank compartment to a thumb lock. I’ve done that on several of my compartments (including the battery cave door) and it’s soooo nice not to have to mess with that friggin key. You can get them at Camping World. I can mail you a couple, if you’re interested. They run about $5.00 ea. I’d probably drive BEHIND a shopping center and look there for dumpsters for the garbage. 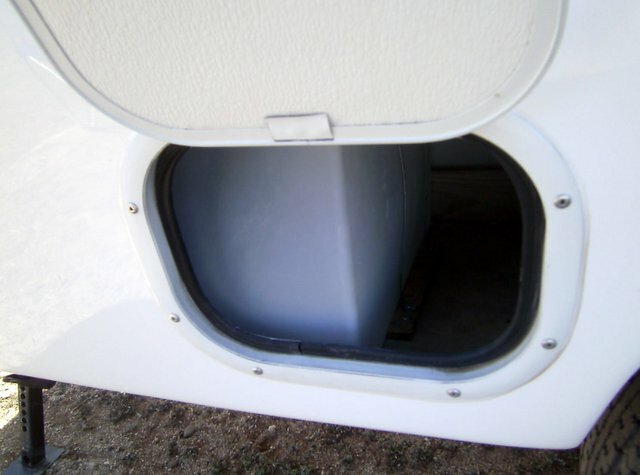 Great information on changing out the lock on the water tank compartment. I’ll probably do that at a later date, don’t want to get involved with mods at this point. Thanks for the generous offer. Since most of the time I use real plates and dishes, I don’t generate much paper trash. It wouldn’t justify a trip to the industrial park. Thank you for putting the link here. I know you love to boondock but there are a few places it would be a shame to miss – like Yosemite ! The smell of pine when we camped in Yosemite was overwhelming! It would definitely give you your pine fix and the scenery was amazing. Just make sure you have reservations 🙂 You could mosey on up there, nice and slow. The waterfalls should be great in late spring. You read about it being so crowded, but there weren’t really any crowds there when we were there. I guess because school was still in session – maybe that’s the secret. Thank you , Pam. One of the wonderful things about retirement is avoiding the crowds by visiting when school is in session. Ah, waterfalls . . . another feature to add to my bucket list! You can also boondock outside the park but it is worth spending a couple nights in the park to see the waterfalls. Incredible place. If you do make it there, go weekdays to help avoid the crowd. Spring is beautiful. Lots of blossoming flowers and trees. And with your old people pass it’s only $10 a night to park the Casita. No hookups but bathrooms are available. That’s a bargain! It’s great being an old people. We live in Southern California and we have some nice areas for you to check out. Big Bear is not far away with the pine forest that you seek. Also Lake Isabella by the Kern River has boondocking and fresh air. You are also welcome to park at our place and check out the local wineries and the beach. Spike and Bridget would love to play with our Golden Lab Sandy. I’m overwhelmed by all the wonderful possibilities! So many pine forests, so little time . . . Thanks for the suggestions and the invitation. Best wishes to you and your Sandy. I too LOVE the Forests and the pines. Having been born and raised in Southern California, I’m used to Yosemite National Park. Although, I lived in Las Vegas Nevada for almost 28 years, so I Love the desert too, but miss the pines. That is why I plan on visiting the Coconino National Forest near Sedona and the Kaibab National Forest Grand Canyon. Regarding trash. I’m going to start out using packaged food such as rice and packaged dinners that can be re- hydrated on the stove. That way, there will be no smell and the trash will be kept to an extreme minimum because of the paper packaging. At least, that is what I’m going to try to do. I can hardly wait to venture out, in less than two weeks, and hit the happy trails to my new adventure. I plan on becoming very good at it, come what may. Thanks again for tips, they are very helpful. …there is also Mt. Charleston outside of Las Vegas Nevada that has plenty of space to park or camp. All these great ideas on places to visit and camp makes me want to put up a page where we can collect them in one place and have a handy resource! I know the day will come when I’ll be searching back through my blog looking for camping and boondocking places. Good luck, FreeSpirit, on your upcoming adventure! Enjoy every trail! Trying to remember if Spikey always had that black spot on his rear or if he got a little too close to the burn buddy. Ha, ha! Glad you found the solutions to every problem. Necessity is truly the mother of invention. Life is good. Funny! Spikey got that black spot from me patting him on the behind every time I tell him I love him. Hey Sue, my home state of Colorado has some beautiful places. It’s not boondocking, but RIdgeway State Park is well worth the cost for a few nights in the San Juan Mountains. I hate campgrounds but really like that one. Nearby is the Owl Creek Pass area, which is indescribably beautiful (also near Ridgway). I grew up not far from there. Also check out Flathead Lake in Montana, same re. campgrounds. Some really nice spots on the lake. I’ll probably be heading up these this summer. And Utah’s Boulder Mountain is nice (not far from Capitol Reef NP) if you like remote. There are some nice areas around Flagstaff. So many places, so little time…with the lack of snow all over the West this year, you should be able to get into the high country much earlier than usual. It’s already in the 70s here in Moab. Okay. Now I’ve got to do something so I can find all these suggestions for beautiful camps. I’m going to put a note at the top of this blog post to check the comments. Thanks for adding to our list of great places! The US has remarkable variety where it is easy to drive to find places that feel like an entirely different country. A steady diet of one environment loses its novelty and, I agree with you, when that happens, it’s time to move. The alluring aspect of full-timing. You can follow spring or fall, avoid snow, or choose bug-free locations, or head for cool forests. Each has downsides: bug-free means fewer birds, and few trees. Lush, deciduous forests with dappled sun peeking through branches comes with insects, wetness, mud, mold, black drips on fiberglass bodies, and storms with risk of damage from tree limbs or worse. But the air in most forested regions is fresh, and the sounds of cicadas and other night insects and birds provide an unparalleled night symphony. Until you tire of it. I call it beauty fatigue. And off one goes to something entirely different: desert, or lakeside, or the bogs of Maine or Canada, or the pine forests of Idaho or Montana. The ‘forests’ of the northern Rockies is quite different from Eastern forests. Cleaner, less ground clutter & growth, easier to walk through, and less trampled by the crush of too many others. But also a fire hazard. No trash burning. Even a few unnoticed sparks can trigger calamity. Use a fine wire mesh screen [similar to mesh of fire screens] to keep embers from wandering. In areas where there are many other boondockers, or lots of RVers of any stripe, and where municipalities charge for waste disposal, public waste cans will be deliberately made hard to find and, when available, kept small; more often, locked away or hidden behind fences at the back of stores and malls to discourage use by outsiders. One of the downsides of boondocking, along with lack of easy disposal of grey and black water, endless fresh water, reliable electric service [even campgrounds, on hot days, have spotty record on this], always ready laundry service, and high speed internet and TV. Few of these can be resolved in a boondock lifestyle. Campgrounds stays provide the occasional fix. But the benefits of enjoying natural settings with few neighbors — million-dollar views no one could ever purchase — makes the inconveniences and work-arounds worth it. And there are times I’m conflicted about letting too many others in on the secret of the RV lifestyle, though it’s fun to read your discovery of it, adaptation, and thorough enjoyment. Some hear the word “RV” and “trailer” and wrinkle their uninformed suburban or urban noses, imaging broken-down dwellings, with a hand washer beside the door, something they saw in a field in West Virginia. Or trailer parks [actually mobile home parks – they make no distinction] filled with lawless, low income n’er-do-wells. I smile and decide not to disabuse them of these beliefs! More empty, glorious spaces for me to enjoy. Let them live, tethered to those costly houses with all that upkeep and soaring real estate taxes, facing the same old views and weather. Or only enjoying new climes with complicated, $$$ travel. The country benefits from both types..
Will you boondock for several years? Unlikely. As the novelty wears off, in a year or two, you will find that you begin staying for longer periods in two or three spots, and then might start to shift one of those stays to a full service campground (perhaps Escapee co-ops), with shorter boondocking periods. Some tire of that phase and begin to hunger for more permanence where they do not have to locate essential services with each new location. Few ever entirely give up the RV until a health issue (mobility or eyesight) make it a necessity. Your experiences are a joy to read. A most interesting comment, Lisa! I enjoyed reading every word. You describe the differences in people very well, and also the variety of camping areas. I may tire of boondocking someday — although right now it’s hard for me to imagine that — but I sincerely doubt I’ll ever want to be crammed in with close neighbors. Some people find two BLM sites not too far from each other, and then go back and forth according to when they get the word it’s time to move. That way they aren’t searching for services. We’ll see what happens. Whatever I’m doing or not doing in years to come, right now my life is enriched every day. I want to keep that going as long as I can. And I haven’t tired of the desert yet! Bill . . . You’ve got the crew and me all figured out. Cheers back at you, K and kids! I found this blog yesterday and read every post.My compliments on your writing style and the day to day information you pass on. Small trailers are the way I want to do the full timing so your blog really helps me . Keep them coming Please. A question , your trailer is 17 ft overall, is the box 14 ft? I love to build stuff, so my trailer will be a 7 ft wide 16 ft long cargo trailer customized to my way of living. Compliments to you on three fronts . . . 1) You read every one of my posts. Quite an accomplishment in perseverence! 2) You’re planning to fulltime it. Quite smart! 3) You’re thinking small and you’re going to customize it yourself. Quite creative and resourceful! I’m pleased you think my blog is an excellent read. Thanks. Sue, I’m exhausted reading your blog and all its comments. But what great information on camping. LOVE your blog and how you are able to make even trash interesting. You’ve definitely got one up on me! Oh, Sherry . . . Neither is better, just different! Thanks for saying you LOVE my blog. Sue, go to an RV centre or locksmith and get them cut new keys cut from the code which is on the original key. They work! Sue, I’ve been thinking about your garbage problem. It’s hard when almost everything we buy has packaging. Since you don’t pay taxes for services, the issue really needs rethinking. Becoming more of a vegetarian IS a good solution! Buying rice, beans, lentils, oats, barley, quinoa, etc in bulk sizes eliminates so much packaging. Buying fresh fruit and veggies using your own bags helps too. You can compost in the desert or at least bury any vegetable matter. And YES! You could grow a few pots of veggies! Lettuce, chard, spinach, kale, herbs, small tomatoes. Think how independent it would make you! Just some thoughts from an old vegetarian and environmentalist…since the ’80’s! I hardly ever buy anything with bulky packaging because most of that stuff requires an oven to heat it up. I do eat mostly fresh vegetables and fruit. Occasionally I eat chicken or tuna fish. That’s about it. I’m not interested in eating a lot of rice, barley, etc. Growing vegetables is not practical because of the weight of the dirt and moving around. Usually I use the trash containers of the stores I shop in. For fabulous pine you are VERY close to Flagstaff and the wonderful Coconino National Forest. It is EXACTLY what you’re looking for. We escaped there from 100-degree heat in Phoenix 2 years ago and enjoyed it tremendously. Cool, wonderful, deep pine with miles of trails for pooch!! It’s probably still too cold now, but will be the perfect place in a few months or so. You’ll also be close to Sedona which is a gorgeous spot to check out. Sorry your comment was delayed (due to link). It went to spam and I didn’t find it until this morning. Apparently there are wonderful dispersed camping sites all around here and to the north/northeast. I’m staying here for the warmth. I’ll be finding those “cool, wonderful, deep” pines! Thanks for telling me about Coconino NF, Sedona, and posting the link.